Versilon™ SE-200 from Saint-Gobain Performance Plastics is now phthalate-free. Saint- Gobain are proud to be among the first companies to offer sustainable flexible tubing product. Versilon™ SE-200 tubing combines the high performance standards customers demand with an eco-friendly tubing design. 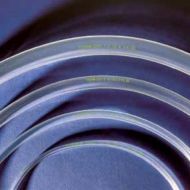 Offering flexibility, glass-like clarity and outstanding bend radius, Versilon™ SE-200 tubing can handle many applications where flexible tubing of the past could not be used. Its FEP inner liner provides the ultimate in chemical resistance and can handle a wide variety of fluids from corrosives to MEK-based solvents. The inert liner limits the potential of fluid contamination during transfer. Versilon™ SE-200 will not impart odour or taste, making it well-suited for food and beverage use. Tygon S3 B-44-3 is specially formulated for transferring a wide variety of beverages including soft drinks, fruit juices, flavoured teas and bottled water. In virtually all cases, Tygon S3 B-44-3 will not affect the taste or odour of products transferred through it, while its excellent non-wetting properties facilitate complete drainage and permit simple flush-cleaning. 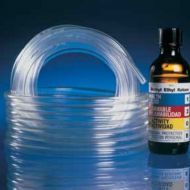 The versatility and proven performance of Tygon™ B-44-3 tubing have made it today’s most widely specified clear, flexible plastic in beverage transfer applications. 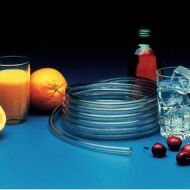 Tygon Reinforced Tubing for Food and Beverage Application A-60-F I.B. 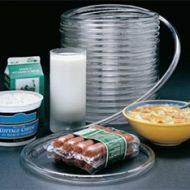 Formulated to withstand extreme temperatures from – 75 °F to 275 °F Tygon® A-60-F IB tubing will not crack or deteriorate when used in demanding food and beverage applications. 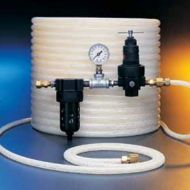 Certain applications require using pressures that only reinforced tubing can withstand. 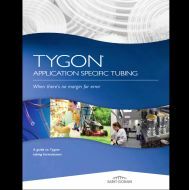 For those applications, Tygon® A-60-F IB tubing is now available. If has the same desirable properties as Tygon® A-60-F tubing with an additional reinforcement embedded within its walls to withstand elevated pressure. Saint-Gobain Process Systems is the leader in antimicrobial technology. Our custom compounding capabilities allow us to produce antimicrobial versions of many of our tubing products. Versilon Silver Antimicrobial Tubing is formulated with a silver-based compound on the inner surface at the point of fluid contact. 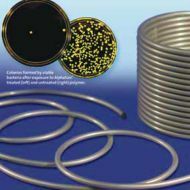 The tubing’s outer surface can be treated in cases where bacteria build up is a concern. 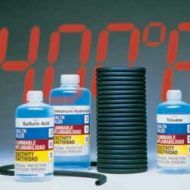 Made of proprietary fluoroelastomer, Versilon ™ F-5500-A tubing has both physical and chemical characteristics that make it ideal for severe environments, such as dry cleaning fluid lines and solvent recvovery systems, where other flexible tubings fail. Versilon ™ F-5500-A tubing can be used in continuous service with temperatures as high as 400°F (204°C). The opaque, black colour of Versilon ™ F-5500-A helps protect light-sensitive materials being transferred and will not prematurely crack and age when exposed to ozone, sun and weather. Tygon S3™ E-3603 tubing from Saint-Gobain Performance Plastics is now Phthalate-free. Saint-Gobain is proud to be among the first companies to offer sustainable flexible tubing products. The bio-based Tygon S3™ line combines the high performance standards customers demand with an eco-friendly tubing. Crystal-clear and flexible, long lasting and crack resistant, the new Tygon S3™ E-3603 delivers the same superior performance you have come to expect but now a formulation that contains a phthalate-free plasticizer. Tygon S3™ E-3603 tubing handles the most stringent foods and beverages. 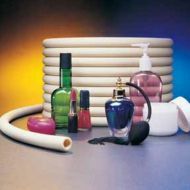 It is non-oxidising and non-contaminating and less permeable than rubber tubing. The Glassy-smooth inner bore helps prevent buildup so that cleaning is facilitated. The coils ar emarked at 30.4cm interval for easy measuring. Producers of food, milk and dairy products insist upon Tygon S3 B-44-4X for dependable performance in countless filling, draining, transfer and processing applications. Its smooth, non-porous bore inhibits particle entrapment, promoting a sanitary fluid path by minimising potential for bacterial growth. It has outstanding resistance to harsh alkaline cleansers and is equally unaffected by commonly used sanitisers. Light in weight and easy to handle, Tygon S3 B-44-4X can be put into service quickly. It readily bends to accomadate abrupt corners and obstructions, requiring a minimum of couplings and fittings. Its flexibility can save up to one-third the footage and much of the labour required to install rigid stainless or plastic piping. The Tygon Application Guide lists the full range of Tygon Products. It lists availability in all sizes. A handy guide is also included that shows each formulation’s resistance to a large variety of chemicals. Versilon Abrasion Resistant Tubing C-544-A I.B. 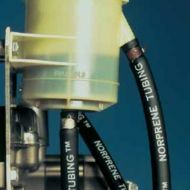 Ultra flexible compared many other reinforced urethane tubings, Versilon™ flexible tubing can be used in the most physically demanding applications, such as those requiring a tight bend radius. Specially formulated from tough, ether-based polyurethane resin, Versilon™ C-455-A IB tubing is resistant to a range of chemicals, including oils, greases, solvents and chemicals. Due of its excellent wear properties, Versilon™ C-544-A IB tubing frequently outperforms trditional rubber, plastic and metal materials when exposed to abrasive conditions. Versilon™ C-544-A IB is plasticizer-free, and remains flexible even when cycled through temperture extremes. Peroxide-cured Versilon® High-Strength Silicone Tubing designed for use in applications where flexibility, resiliency and durability are required. Produced from a proprietary combination of silicone elastomers, this tubing optimizes critical physical properties such as tensile strength elongation and compression set, resulting in a more physically durable product. The smooth inner surface reduces the risk of particulate entrapment and microscopic build-up during fluid transfer. Specially formulated for chemical dispensing. Tygon® A-60-G tubing outperforms neoprene, EPDM and other general-purpose tubings in test after test and application after application. It will not weaken or crack after years of exposure to heat and ozone, providing longer pump life in industrial and institutional clean-chemical dispensing application. Engineered for outstanding performance and on-the-job reliability, Tygon® A-60-G handles temperatures from -75°F (-60°C) to 275°F (135°C), allowing the use of one material with a broad range of temperatures. It is heat sealable and can be joined without fittings. It also has excellent resistance to inorganic (acids and bases) fluids. 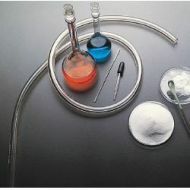 Versilon™ Plasticizer-free Tubing is a uniquely engineered to provide flexibility, chemical resistance and extended pump life in a clear, plasticizer/oil free tubing. It is ideal for a broad range of applications including peristaltic pump applications, soap and detergent dispensing, water purification lines, food contact applications and chemical transfer. Formulated to withstand extreme temperatures from – 75 °F to 275 °F Tygon® A-60-F tubing will not crack or deteriorate when used in demanding food and beverage applications. Extremely flexible, it resists kinks and retains its shape while installing quickly and easily. Its excellent flexural fatigue resistance makes it the absolute best choice for use in peristaltic pumps often found in dispensing equipment. Repeatedly autoclavable, it can be steam cleaned in place, eliminating the need for frequent tubing replacement. When harsh sanitizing solutions are used, it exhibits exceptional chemical resistance and is entirely unaffected by a wide variety of cleaning solutions.